WBO #6 Christopher “Pitufo” Diaz and WBO Latino Champion Luis “Popeye” Lebrón ready for fights this Sat. With five fights and the world ranked Christopher “Pitufo” Diaz and Luis “Popeye” Lebrón in the main bouts, this Saturday, November 24, returns the series “Sabado de Campeones en Casino Metro Boxing Nights”, to take place in the San Juan Ballroom at the Sheraton Puerto Rico Hotel & Casino in San Juan, in a presentation of PR Best Boxing Promotions (PRBBP), in association with Spartan Boxing and Top Rank, to be broadcast live on Wapa Deportes. “This is going to be our second event of the year (at the Sheraton), this promises to be much better than the previous one, it’s a very important date and we are very excited about this great event, in which we have world-class fighters,” said promoter Iván Rivera, president of PRBBP. In the main event of the evening, Barranquitas native Pitufo Diaz (23-1, 15 kos), who comes from a defeat in July on dispute of the WBO world title in 130 pounds against the Japanese Masayuki Ito, will fight with the Hungarian David Berna (17-5, 16 kos) to 10 rounds and 127 pounds. Diaz, 23, is ranked sixth by the WBO at 126 pounds right now. “I come from a loss in a 130-pound title fight, it was a great experience, you learn a lot more about the loss, we’re two or three bouts before the world title fight, early or mid-next year I’m going to be world champion,” said Diaz, who has not fought in Puerto Rico since February 2017. His opponent, Berna, indicated, through his interpreter and trainer Zoltan Petranyi, that “I am grateful for the opportunity, I come to fight, that is my plan”. In the co-main event, the WBO Latino monarch in 126 pounds, Popeye Lebrón (13-0-1, 7 kos), will defend for the second time his belt against the Mexican Luis May (21-10-1, 8 kos) 10 rounds. In his last bout, Lebrón, who will fight for the fifth time in 2018, won by technical knockout over Darryl Hayes on September 1st. 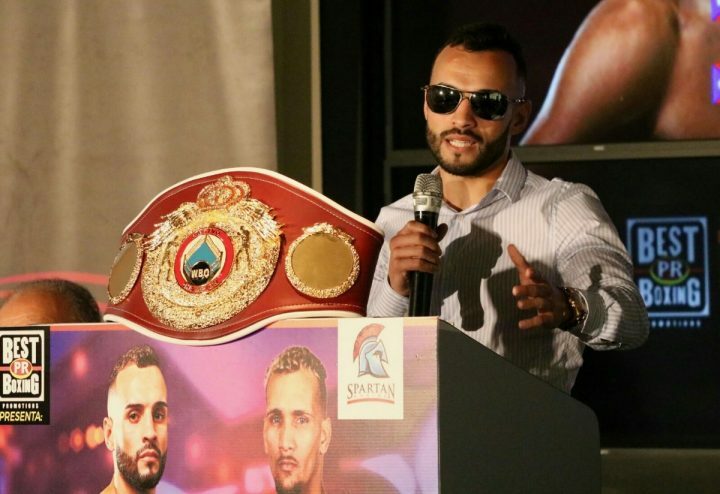 “I am happy and grateful, we have worked with conscience, it is going to be a fight that will be a war, come to see a great fight,” said Lebrón, ranked 12 by the WBO at 126 pounds. While, May said that “I come to represent my country proudly, we know about the rivalry between Mexico and Puerto Rico and this war it will not be the exception, there will be war, I am going to give everything”. The undercard have Puerto Rican descent, Joseph Adorno (10-0, 9 kos), making his debut in the Island, when he faces Mexican Luis Gerardo Avila (6-14-3, 3 kos) in 130 pounds and six rounds; in the same weight and also to six rounds, the unbeaten Henry “Moncho” Lebrón (6-0, 4 kos) will face the Hungarian Mark Szoros (5-4, 3 kos). Meanwhile, in a four rounds bout, undefeated boxers Patrik Cora (3-0, 3 kos) and Alfredo Mejías (3-0, 1 kos) will face each other at 154 pounds. Wapa Deportes live broadcast will start at 9:00 p.m.